A small road cuts into woods a few kilometers ahead of picturesque Pahalgham town in South Kashmir’s Islamabad district. The narrow road, after crisscrossing through pine trees, ends up on top of a small hillock called Gujjran Batkoot village. A few years back this nondescript village was known for two things only: serenity and encroachment by land mafia. Not anymore. Sakeena Akhter, 15, a 9th student of Government High School, Batkoot, Pahalgham, has put Gujjran village in focus because of her athletic adventures. Akhter, now known as the “Milkha girl” among her admirers started her journey in May 2015, when she participated in Zonal level race held at nearby Ashmuqam village. “It was out of sheer curiosity that I enrolled myself for the race, otherwise I had no formal training. Nor did I knew what an athlete meant,” says Akhter, who shocked everybody by winning the race with a big margin. The win made Zones physical education teacher notice Akhter. Next month Akhter was chosen for district level competition by Youth Services and Supports (YSS) to compete in Inter Zone competition help in nearby Mattan area. A month later, June 2015, Akhter participated in district level competition held at Islamabad town. 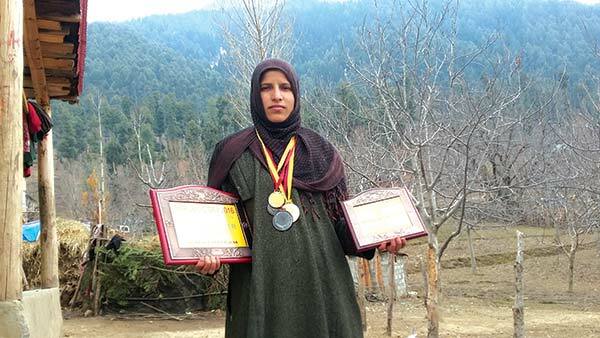 After her successful run at this level Akhter was chosen to participate in state level competition held at Jammu. “I had never stepped outside my village. Going to Jammu was like a dream,” says Akhter. After the selection for state level competition, Akhter began working on her stamina. “I needed no practice as I have to trek two kms daily to reach school,” says Akhter. At Jammu, Akhter bagged first position in 3000 meter race, shocking everybody including her competitors. “I was speechless when I crossed the finish line and saw that others are still far behind,” says Akhter. When Akhter came back with a medal, her father, who rears cattle for a living in Gujjran village, could control his emotions. “I will do whatever I could to make her realize her dreams,” said Mohammed Abdullah Dedad, Sakina’s father emotionally. Finally after convincing her parents Akhter left for Jammu to participate in national level competition. “I bagged sixth positing. It was quite an achievement as the event was national level competition,” says Akhter. It was quite an experience for Akhter who had spent her entire life inside the woods of Gujjran village. “Our village was electrified only a few years back. Now you can understand what it meant for me to compete with national level players,” says an excited Akhter. Akhter’s father is supportive but fears to go against the norms of his community. Meanwhile, because of her focus on sports Akhter failed to pass two subjects in 9th standard. After learning about Akhter’s poor academic performance, Chief Education Officer, Islamabad, Mushtaq Ahmed Salroo directed school authorities to pay special attention to her. “I don’t plan. I am taking life as it comes, one step at a time,” says Akhter with a smile.